When North Korea unveiled the Arirang smartphone last August, many experts questioned whether the device was truly a Korean invention or whether it was more like North Korea's Samjiyon tablet, which turned out to be a clone of a Chinese tablet. 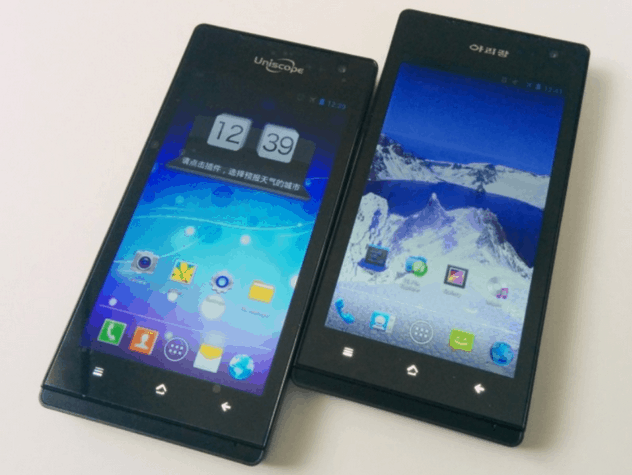 It turns out those doubts were justified, because new information has revealed that the Arirang AS1201 smartphone is in fact either a copy of or simply a rebranded version of the U1201 smartphone from Uniscope. We don't have complete details on the AS1201, but according to online retailers the U1201 runs Android on a dual-core Snapdragon S4 1.2GHz CPU with 768MB RAM and 4GB storage. It has a 4.3" screen with a resolution of 960 x 540, 2 cameras (2MP and 8 MP), 3G, and generally specs on the same level as a low priced budget smartphone - in 2013, anyway. Given that Qualcomm is a US company, it is unlikely that this official North Korean smartphone still has a Snapdragon chip in it (it would be cause for a DOJ investigation). But aside from the change in the home screen (and the probable changes to lock down the Android OS) there's little to say exactly how the two models differ. From what I can see, no one has posted an extensive comparison of the devices, just a few photos. That's probably because the AS1201 is difficult to find even in North Korea, much less out of it. The Uniscope U1201, on the other hand, current costs 638 yuan in China through online store JD. You can purchase it through this link here or visit the Uniscope official website.